The Artwood Series was crafted to produce a traditional yet modern guitar. Technology moves forward at a frantic pace and the world of guitar craftsmanship is no different. In producing the Artwood Series, Ibanez has respected both the rich tradition of the acoustic guitar while adding modern interpretations in its continuing search for the ultimate in guitar tone. 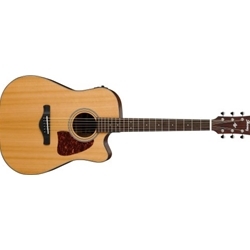 The AW450CENT Artwood Solid Top Dreadnought Acoustic-Electric guitar features their Dreadnought body shape with single cutaway for easier access to all frets, a solid cedar top, mahogany neck (satin finish), back and sides, a rosewood fretboard and tortoiseshell body binding. It also comes with a bone nut to deliver a well-balanced sound, a bone saddle on a distinctively contoured rosewood bridge with Ibanez Advantage bridge pins, and chrome Grover open gear tuners with butterbean knobs. When you need some more amplification, the AW450CENT includes a Fishman Sonicore pickup with Ibanez AEQ-SP2 preamp and onboard electronic tuner. Remix is an authorized independent Ibanez dealer. Get you new Ibanez today..